I remember when I first moved out on my own so many moons ago, I almost got “sticker shock” from all of the bills that come with having your own home. Whether it’s water bills or gas bills or phone bills, they just don’t teach you this stuff in school. Once I started paying bills for the home, I became much more conscious of ways to reduce those bills – whether it’s turning the thermostat down or making sure not to leave the water running. Since then, there have been many innovations that can help reduce the cost of living, including new energy efficient bulbs. My current home has a lot of lights – and I mean a lot. One room has 6 scones, another has no less than 15 overhead lights. Every time I turn on those lights, while they make the room nice and bright, I can’t help but thing how all of those lights can effect my electricity bill. 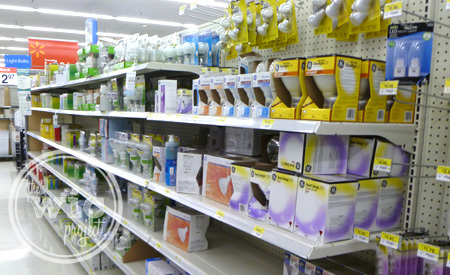 So last weekend, I went on a mission – a mission to Walmart, where I purchased some new energy efficient bulbs from GE. There were oodles of GE energy efficient bulbs to choose from, whether it was their GE Energy Smart CFLs or their Energy Efficient Soft White light bulbs. Checking out the different options, I was amazed at how much less energy the CFL bulbs used and how little the cost/year was for the bulbs. For example, the new indoor floodlights I purchased cost just $1.81/year to run. Compare that to a traditional indoor floodlights which costs $7.83/year. Multiply that times 15 bulbs (in one room!) and that comes to $27.15 per year with the GE Energy Smart CFL Indoor Floodlights versus $117.45 per year with the traditional floodlight. BIG DIFFERENCE! Not only that, but the CFL bulbs last a lot longer – about 4 times longer. The traditional floodlight clocks in at about a 2.2 year lifespan while the GE Energy Smart CFL Indoor Floodlight has a 9.1 year lifespan. Once you start calculating bulb replacements, the savings cost becomes much, much more significant by switching to an energy efficient bulb. It didn’t take much to convince me to replace every single bulb in the house. First, I tackled the “great room” where there were 6 wall sconces. Four of them used rinky dink decorative bulbs. 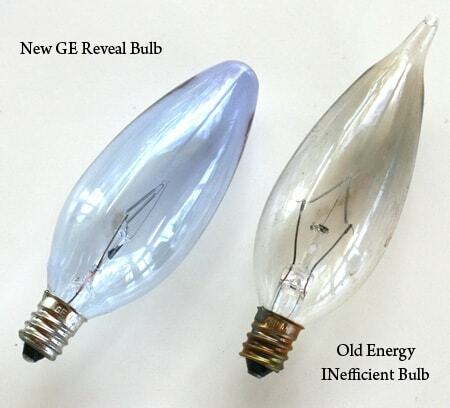 Those got swapped out with GE Reveal Clear bulbs. 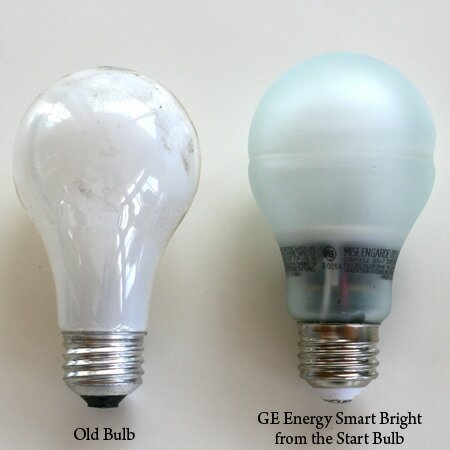 The clear bulbs create a “whiter” light versus a yellow light from traditional bulbs. Then I swapped out the other two wall sconces with new Energy Smart Bright From the Start Bulbs. These bulbs use GE Hybrid technology that create a warm soft light that is similar to incandescent bulbs, but lasts longer and saves money. These new bulbs have an estimated energy cost of just $1.85 per year. 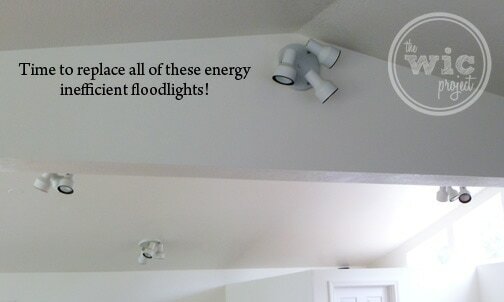 Finally, I tackled the kitchen/dining areas where there are 15 indoor floodlights. Swapping these out was like hearing money in the bank as I knew that each bulb was saving me ~$6 per year. So nice. 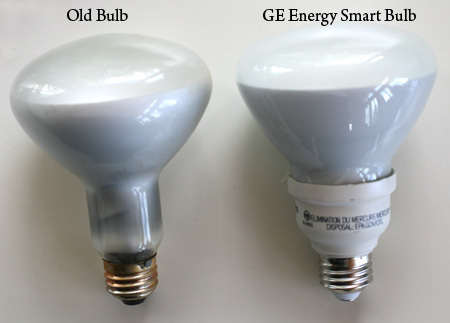 Switching your bulbs to energy efficient bulbs, like the ones I mentioned from GE, are an easy way to reduce your energy costs. You can use the special energy savings calculator to get an idea of how much you can save by switching to GE Energy Smart CFL light bulbs. I plugged in the information for my home and switching all of the lights will save me (wait for it) $528.23 per year and $2,894.40 over the life of the bulbs. That is a LOT of savings! For more tips on how you can save energy, make sure you follow GE Lighting on Twitter and on GE Lighting Facebook. You can also browse my shopping trip photo album for an idea of some of the bulbs available and their prices. If you’ll be heading out to Walmart to pick up some new GE Energy Smart Bright From the Start CFL bulbs, make sure you grab this coupon for $1.00 off your purchase. 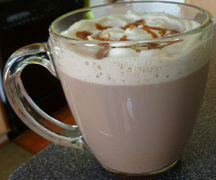 Plus, for every coupon that is printed and redeemed, $1.00 will be donated to the Foundationg Fighting Blindness. 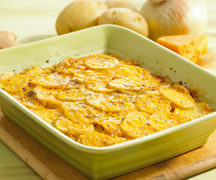 I challenge you to use the calculator yourself and leave a comment sharing how much you would save by switching to CFL. Do your savings top mine? I love your side-by-side pic comparisons! How awesome that you are going to be saving so much money from these new light bulbs!! I don’t know the exact cost savings, but I LOVE that I don’t have to disassemble light fixtures as often to change bulbs with the new kind – it is such a PITA to find ladders, try not to break everything, etc. – and now I only have to do it every few years for most lights in my house! Hopefully other things can be improved as much as lightbulbs have been in the past few years! I agree! I still remember when CFL bulbs hardly fit into anything. Now you can barely tell the difference between CFLs and the old bulbs! I love your side by side pics! Great job! Thanks for the Side by side comparisons. I also noticed the savings last year I was using traditional light bulbs in the 3 fan lights this year I switched to the an LED energy efficient light and now my electric bill is about 1 or more cheaper than last year at the same time. I was wondering about the light tone/color of the new bulbs- do your rooms look really stark now or do they still feel warm? I think it’s great that you saving both money and energy. I wish more people would take the time to replace their bulbs with more energy efficient bulbs. I love all the energy efficient bulbs they’re coming up with now-a-days! I agree. 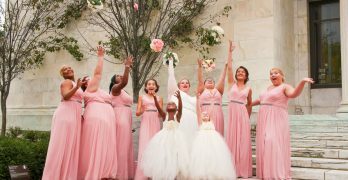 There are a lot more options now than there were before!